Thorgal and family have sailed from their island home in search of a new place to set down roots, but along the way the twin boats run into a storm in which Thorgal and Wolfcub become separated. By the time the sea has calmed the other boat is nowhere to be seen and Thorgal and Wolfcub find themselves caught in a current that is dragging them into some sort of fog bank, on the other side of which is a hidden island with an isolated population ignorant of an outside world. While escaping up the cliff face from a mass of spiders Wolfcub strays into a cave and is magically prevented from leaving, forcing Thorgal to complete the hazardous climb and step onto the hidden land above. It’s one of fertile soil, good produce and what appear to be contented people, but having no understanding of a wider world they take Thorgal for a demon and he finds himself thrust into a locked cell to await his fate. Meanwhile, within the heart of the island, Wolfcub is pushed deeper inside by her fear of the spiders, until an elderly woman commands them to leave her alone. She appears taken with Wolfcub and proceeds to tell her a tragic tale of a love lost, in which the gruesome details reveal a black and heartless curse that sees a young princess transformed into a hideous spider-like creature to which the populace must sacrifice her a husband each equinox by thrusting him into her labyrinth beneath their city. It’s into such a maze that Thorgal is destined to be thrown, but he’s a man of courage and resourcefulness so he doesn’t go in unarmed even if he can’t exactly be prepared. It’s here among the cobwebs that he must restore some sort of normality to the people of the island if he’s to hope of seeing Wolfcub and his other family members again. If you found Shelob’s lair one of the more skin-crawling moments of Lord Of The Rings then you’ll have something of an idea of what Rosinski and Van Hamme have planned here, although it’s a very different tale, feeling more like a missing Greek myth with its tragedy and monstrous beast. 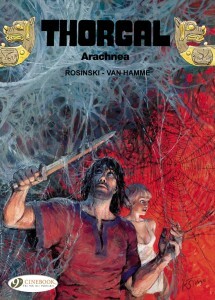 Van Hamme consistently manages to tell a cracking good tale regardless of the genre he’s working in, and Thorgal remains one of his best books with its inventive mash-up of the historical and fantastical, something that Rosinski seems the perfect choice to visualise each and every time. Sixteen volumes in and I still get the same buzz when I begin reading a new one – can’t be bad.